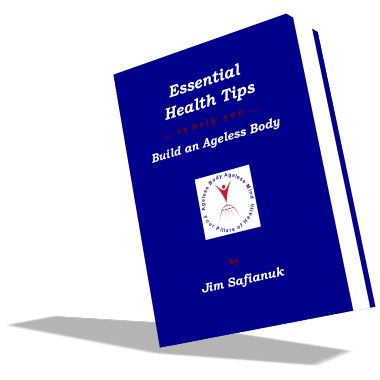 The first e-book in our two-part tips series is entitled Essential Health Tips. Here, once and for all, you learn the truth about clean oxygen, pure water, natural food, and full-spectrum light. What do you mean? In the mainstream media, half-truths and misinformation prevail when it comes to these all-important, essential nutrients of life. Now, you get all the information that is missing and that you need to build a new you at the cellular level. Essential Health Tips is for everyone who wants to pull themselves back from the threshold of disease and return to a baseline of health. The e-book is also geared to moving you deeper into the health zone and helping you build an ageless body at the cellular level. Everything is discussed in an easy-to-use, tips-based format. A number of myths about the essentials of life are debunked along the way. Resources are included throughout the book. This is the first edition of Essential Health Tips. The publication is available in the easy-to-read PDF e-book format. In terms of your health, nothing is more important than the above nutrients. But, once and for all, you need to get it right! The tips in the e-book provide the following health benefits and are presented in an easy-to-use, tips-based format to make sure that you do get it right. Clean oxygen plays a vital role in your health. Oxygen-starved tissues gradually deteriorate and die, often causing noticeable symptoms and increased susceptibility to infectious disease. You Avoid Circulation Problems: The build-up of plaque in the arteries restricts the transport of oxygen in the blood throughout the body and is a major cause of circulation problems. A lack of circulation in the joint tissues may lead to arthritis-like pain. In the kidneys it may lead to kidney disease. You Prevent the Onset of Heart Disease: A lack of circulation may cause heart disease. The heart gets its oxygen from the coronary artery. If this artery gets blocked, the cells of the heart begin to die. You Dodge Degenerative Conditions: A lack can also lead to the development of numerous degenerative conditions, lower resistance to infection, and promote abnormal, potentially fatal growths. You Prevent the Growth of Cancer Cells: In a depleted environment, normal cells can easily mutate and become cancerous. Cancer cells thrive in a low-oxygen environment deriving their nourishment from the fermentation of sugar. The cells grow rapidly, but since they are mutated, do not function normally. You Avoid the Growth of Microbes: Most disease-causing organisms reproduce with more vigor in the absence of oxygen or are able to survive and grow in living cells whose ability to ward off infection is weakened by an environment that is lean on this nutrient. This includes fungi, bacteria, and viruses. With the pure water way described in the Essential Health Tips you are getting proper hydration from pure water and fluids made of pure water. This will make your cells jump for joy when you are consistent on a daily basis. decrease bloating by flushing out sodium. With the Natural Whole Foods Way described in the Essential Health Tips you are getting proper nutrition from the macronutrient groups, which includes the right carbohydrates, quality protein, and good fats, as well as plenty of fiber. We are certain the tips about the natural whole foods way of eating will turn a wrong into a right. What is now known without a doubt is that not consuming enough natural, whole foods on a daily basis can initiate many chronic, degenerative diseases and contribute to a rapidly aging body. A. Because the body is not receiving the essential nutrients it needs on a daily basis to do its many functions, as well as repair and regenerate itself at the cellular level. In short, it starts to shut down, which is not a good situation. affects the body, in so many other significant ways. The human body is dependent on sunlight. Besides stimulating vitamin D3 production, natural light affects the body in many significant ways. It is indeed one of the most important of all the essential nutrients. There is no mistake in saying that we are indeed creatures of light! However, human health requires full-spectrum natural light, including the ultraviolet (UV) rays in moderation. The sun is good for you and it is absolutely needed. You Prevent Mal-illumination: Windows, windshields, eyeglasses, sunglasses, sunscreens, and smog all work to filter out parts of the light spectrum and contribute to the problem. Research reveals that if certain wavelengths are not present in light, the body cannot fully absorb some of the nutrients in your diet. In addition, poor light poses a serious threat to health. The kind of light adequate for maintaining health must contain the full spectrum of wavelengths found in sunlight. However, most indoor artificial lighting, both incandescent and fluorescent, lacks the complete, balanced spectrum of natural light, and interferes with the body's optimal absorption of nutrients, a condition called mal-illumination, which is analogous to malnutrition. You Avoid Chronic Depression and Sleep Disorders: Disturbances in the circadian rhythm can lead to health problems such as chronic depression and sleep disorders. You Do Not Get Seasonal Affective Disorder: Although many variables may be responsible for this disorder, lack of exposure to the full spectrum of wavelengths found in natural light seems to be the most logical explanation. The key hormonal change may be a reduced secretion of melatonin by the pineal gland and an increased secretion of cortisol by the adrenal glands. You Prevent Accelerated Aging: Not enough natural light impairs the functioning of our body and hastens the aging process. You Do Not Get Skin Cancer: Studies indicate that fluorescent light, not exposure to natural light, promotes the development of skin cancer, or melanoma. This is consistent with other studies that show that vitamin D3, whose production is stimulated by UV light, suppresses the growth of malignant, melanoma cells. So, a sunlight deficiency can lead to a vitamin D3 deficiency, which in turn could favor the development of melanoma. A. By weaving the essential health tips into your lifestyle you are certain to build an ageless body over time. Remember, your body needs clean oxygen, pure water, natural food, and full-spectrum light. Proper nourishment with the essentials is of the utmost importance for cellular health. And keeping your cells healthy works to build and maintain an ageless body. than those who do not get enough of the essential nutrients of life. I am certain the essential health tips will help you rebuild your body at the cellular level. Weave the tips slowly into your lifestyle and apply them over and over again until they become second nature. Remember, even though it is easy to regenerate your body, it does takes time. So, go slow and reap the benefits offered by the four essentials. E-book Price: The 130-page Essential Health Tips is priced at $127.00 USD. Our Guarantee: Your purchase comes with a 180-day money-back guarantee. This means there is no risk and no obligation on your part. If your health, energy, and vitality do not begin to soar after weaving the essential health tips into your lifestyle ... simply return the e-book within the above time period and we'll refund your complete purchase price with no questions asked. Your Account: Orthocellular Nutrition and Exercise Inc., guarantees that under no circumstances will unauthorized billings or recurring transactions be applied to your credit card account. All products purchased from Orthocellular Nutrition and Exercise Inc. via this site will always be shipped or made available for download. Orthocellular Nutrition and Exercise Inc., E-Junkie.com, and PayPal.com will never debit your credit card for a higher than advertised price. With the Essential Health Tips, Jim holds back nothing when it comes to the truth. In this way, you get an e-book by an author you can trust and a wealth of advice that is of the highest quality. The health information is all evergreen content that will stand the test of time. You will use the tips for years to come on your road to an ageless body. After all, as Jim often states, "An ageless body is our birthright." Jim realized that most men and women in North America consistently lead a lifestyle that is conducive to producing disease early in life. When you live a life that is outside the boundaries that have been set by where we now stand on the evolutionary scale, you set yourself up for illness. We are still hunter-gatherers and creatures of clean oxygen, pure water, natural food, and full-spectrum light. maintaining the integrity of the little factories, which are our 70 trillion cells. To do the above jobs and function properly our bodies need the correct building blocks in terms of the essential nutrients on a daily basis. A good analogy is try to build or renovate a house with inferior materials. It won't last long. The same goes for out bodies at the cellular level. To turn a wrong into a right, Jim decided to write and publish the truth in a format that seemed most applicable to today's world. Hence, the Essential Health Tips was born. This approach provides health information in short snippets, as well as in a Question and Answer conversational style, as if a person was sitting across from Jim at a table and asking him questions. To cover all the bases in terms of the four, essential nutrients and to delve deep into each topic, Jim had to draw on his science background, experience in industry, and analytical abilities, as well as his talents as a professional writer, both article and technical, and his current understanding of holistic nutrition from the standpoint of natural foods and fluids, as well as the important roles played by oxygen and light. E-book Price: The 130-page, Essential Health Tips is priced at $127.00 USD. The Essential Health Tips is one of the great equalizers when it comes to the truth and addresses the important health information that is missing in today's world, especially if one has been exposed for too long to the mainstream media where half-truths and misinformation prevail. We are certain that it fills this information gap. It also serves to debunk a number of mainstream myths and misconceptions along the way. Here, in this handy collection of tips we guide you in accomplishing your health goals by covering all the bases in an easy way. The e-book also includes a number of protocols and procedures, where appropriate, to help you put the health tips to immediate and future use.